We’re off to a great start on a beautiful relationship!! Gadi Avigzer estimated my job, and Nick and his crew moved me out of my house and into your storage facility a few days ago. I’ve been by your warehouse two times now, and all your employees have been just wonderful! I was kind of nervous about moving all my stuff into storage, but Gadi was so understanding and really helped me to feel comfortable with it all. I felt like the whole NorthStar team took extra special care of me. I really appreciate the personal time and attention. I think that’s what most people want when they move or put their valued and personal possessions into storage. NorthStar you get high marks on all counts!! 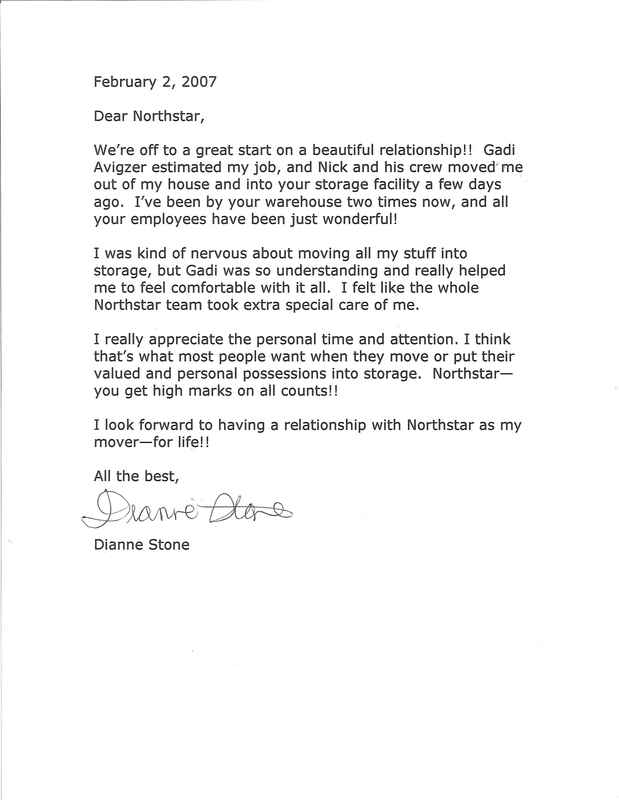 I look forward to having a relationship with NorthStar as my mover-for life! !